« Melikov’s Horses to Watch, Jun 2011, cont. 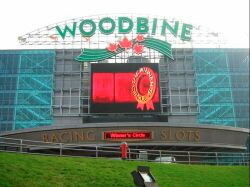 Woodbine has a stellar card slated to do battle today. That is the easy part. The challenging stage is finding our way across the sweeping turf and cashing tickets. Hopefully, this will stimulate some thought into a great day of racing. The weather is a beautiful 76 degrees with partly sunny skies in the forecast. Yesterday, the track was labeled “good” for the turf, and closers held sway with Clemente Rock winning the “Charlie Barley Stakes” and Court of the Realm shocked in the “King Edward Stakes.” I envision a track with a bit of give to the sod, and fair running on this marquee day. If you believe in a horse-for-the course angle. #7 Stormy Lord (3-1) looks to fit the bill. With 9 starts over the Woodbine course, and 8 ITM efforts, this gelding by StormyAtlantic looks to enjoy the cutback in distance from 7f to 6 panels where he is 1/1 at this distance. The tracks should dry out a bit, and should fit him well for rider Jim McAleney. #7 Musketier (2-1) looms a danger in this heat. 1/1 at Woodbine, and has faced much better. G-3 action fits his liking, and this German-bred is a stone cold closer with John Velasquez for Roger Attfield. Todd Pletcher comes into town, and John V in the saddle. They win 28% together, and when this barn comes North, it usually yields good things. 2/2 at Woodbine, and 2/3 ITM on synthetic. Yesterday, the track played good for speed and there was rain to damp down the track. Today should offer a fair surface, and the connections are solid. Patrick Husbands for Roger Attfield who is seeking his 9th Queen’s Plate. The Plate Trial was a good indicator, and they win 27%. After breaking in the air last out, and winning by 3 1/2 is impressive. A Giant’s Causeway runner who is making a second start off a layoff. Chad Brown is the trainer, and Eurico DeSilva is the pilot. After that nice run in the Trial, he worked a bullet at Saratoga over the Oklahoma training track which is very deep. He should come back fit, and after facing Derby-bound runners in the year. He should find this more to his liking.